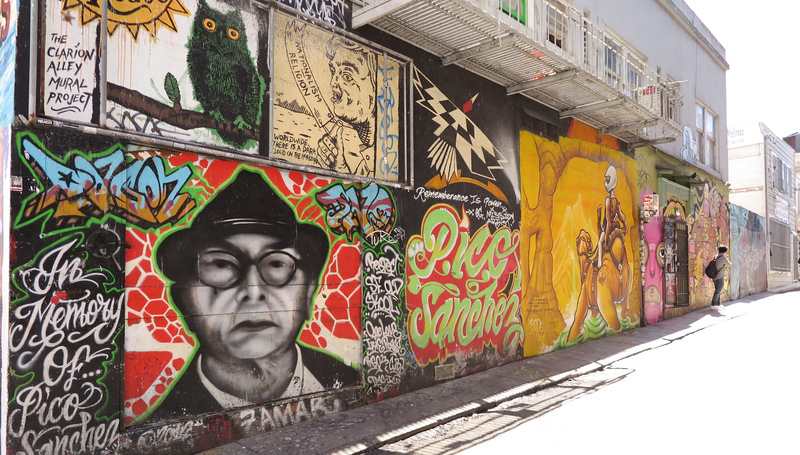 Long view of Clarion Alley with various murals by CAMP. Photo by Dawn Starin. 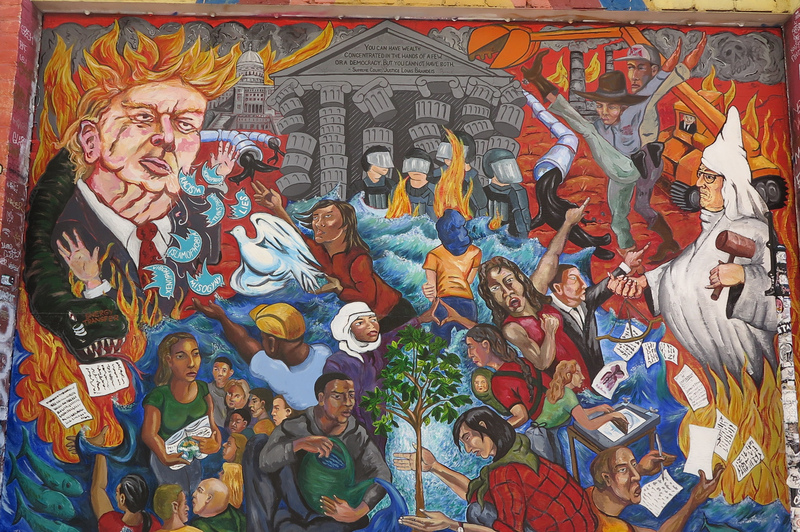 Clarion Alley’s thought-provoking, provocative, clever and often political art was created by those determined to leave a record of their existence and experience and to give voice to marginalized and disenfranchised communities. This small passageway, just 560 feet long and 15 feet wide, runs between San Francisco’s Mission District’s 17th and 18th streets and connects Mission Street with Valencia Street. Once known as a working class Latino neighborhood, this area is rapidly changing. Long-established 99 cent shops, family-owned bodegas, taquerias, empanada shops and bars and rent-controlled, affordable apartments are being replaced by newly established designer boutiques, organic delis, specialty chocolate and coffee shops and luxury penthouse condominiums. This is now a district where homelessness is observable at nearly every corner, where long-time residents on low income often feel their culture and way of life are under attack and resentments can run high. What they feel is real. According to a Brookings Institution study, All Cities are Not Created Unequal out-of-control housing costs and household income inequalities may make it impossible for low-income residents to continue to even live in San Francisco. “Affordable Housing/Vivienda Asequible” created by Art Hazelwood and San Francisco Print Collective in 2017. Photo by Dawn Starin. The walls lining this passageway are notable for the street murals depicting many of the concerns of this rapidly changing neighborhood. 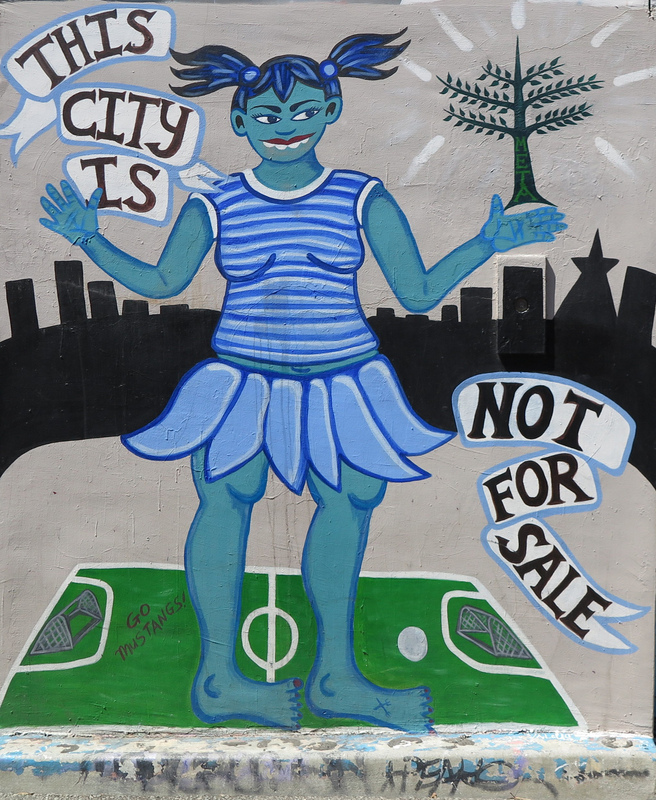 Created by members of the Clarion Alley Mural Project (CAMP), a collective of grassroots, community-based, volunteer artists/organizers, these murals represent the struggles of those who are often invisible or ignored. Founded in 1992 and originally drawing inspiration from the long-standing local political activism, resident Latino artists and the Mission District’s renowned Balmy Alley murals initiated in the early 1970s by (Chicano women ), over the years CAMP has been an active supporter of over 500 artists creating over 700 murals across these walls. Walking through the alley, taking in the head-to-toe and beyond, politically charged, socially engaged and aesthetically imaginative art, there is no one single theme, style, artist or emotion displayed here. 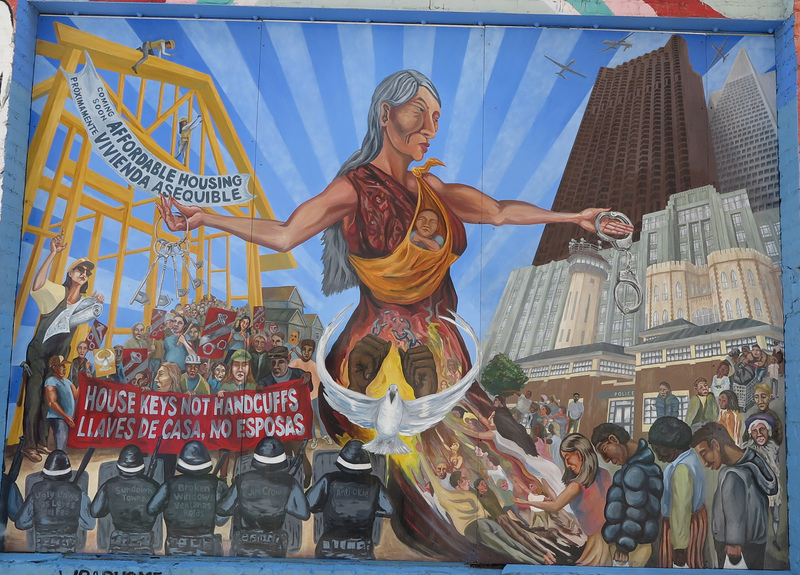 These vibrant murals illustrate the need for criminal justice reform, environmental protection, gender equality, social justice, education, and fair housing and wages. Over the years the walls have featured realism, surrealism, cubism, Mission school, folk and outsider art, Zap and even Archie and Jughead comic-ism. Artists hail from all ethnicities, ages and levels of experience. Past and present artists include Mark Bode, Shaghayegh Cyrous, Maya Hayuk, Crystal Hermann, Barry McGee, Rigo 23, Isis Rodriguez, Andrew Schoultz, Keyvan Shovir, Mel C. Waters, The Anti-Eviction Mapping Project, the Arab Resource Organizing Center, Hospitality House, and the San Francisco Print Collective. “Cultivating Resistance” created by CAMP and San Francisco Poster Syndicate in 2017. Photo by Dawn Starin. Some murals depict hope and joy, fantasy and whimsy; some depict anguish, chaos and pain and tales of a turbulent past; some are wonderfully irreverent and some are almost seriously spiritual. The majority of them inspire and encourage us to look for solutions to the multi-problematic issues increasing in this neighborhood, in the rest of the Bay Area and beyond and remind us of what it is to be human and humane. The term “graffiti” often conjures up images of vandalism and/or the mindless destruction and defacement of property. It often elicits anger in local populations who call for it to be immediately expunged or painted over. Here, the collective artwork has enhanced the urban landscape and often instilled respect and awe in those lucky enough to see it. Perhaps even more importantly, it offers an ever-changing educational portrait offering both a realistic understanding of the past and present and a hopeful, get-engaged-now picture of the future in this possibly disappearing multi-ethnic, multilingual neighborhood. Here the street art is being used as a consciousness-raising tool, a tool for economic, cultural, social and political communication, resistance and activism and community celebration. Here it is a legitimate force for good and one of the few remaining ways the suppressed and subjugated, and those supporting them, have to respond to their surroundings in an expressive public way. Given the non-ending cavalcade of lack of trust and opportunities, rising hyper-gentrification, economic inequality, labor and housing struggles, gender discrimination, environmental ignorance and the many conflicts over religion, immigration and race spreading through this land, this panorama of colorful educational messages and edifying confidence on display in an American city for the many who are marginalized is a powerful force for dignity, compassion, respect and social justice. Walking through the alley I see people from many continents posing for and taking photos and videos. I hear voices speaking many languages. With at least 200,000 annual visitors from all over the world viewing these powerful messages, hopefully these welcoming walls will help foster a much-needed and long overdue conversation and understanding of the many issues affecting the powerless, ignored, disadvantaged, excluded and/or alienated members of society; not just here but around the globe. Dawn Starin is an anthropologist. Her writing has appeared in publications as diverse as Behaviour, The Ecologist, The Humanist, Natural History, The New York Times, Philosophy Now and Scientific American. A previous version of this article appeared in The Progressive.